Earlier this year, Cloudfare Inc., a website performance and security company, had rolled out a new free public domain name system (DNS) resolver service with 1.1.1.1 as its IP address on April Fool’s day. The company has now released the mobile apps of the 1.1.1.1 privacy-first DNS resolver service for Android and iOS users. “The 1.1.1.1. app makes your Internet faster and more private. It is darn easy to set up. And, the best part: it’s free! “It is the right thing to do. We are making it easier for everyone to make their experience when they use the Internet more private. People should not have to pay to have a more private Internet. “Beyond that, millions of websites rely on Cloudflare for performance and security. By getting more users on 1.1.1.1, we make those sites faster. That makes Cloudflare better, and it makes the Internet better, a win-win,” Mohd Irtefa the Product Manager at Cloudflare, said in a blog post. For those unaware, DNS services are usually provided by Internet Service Providers (ISPs), and allow you to change a domain name, for instance, like Google.com into an IP address that routers and switches can understand. DNS basically changes names of websites into numbers, which could slow down your web browsing if you aren’t using a speedy DNS server. While Cloudflare’s 1.1.1.1 DNS service is a basic DNS server, it is different from your ISP’s or other DNS alternatives like Google Public DNS and Cisco OpenDNS, as its goal is to provide users’ faster internet connection and offer utmost privacy. “Any time you are on a public internet connection people can see what sites you visit. Even worse, your Internet Service Provider is very possibly selling all of your browsing history to the highest bidder. We have a tool called 1.1.1.1 which makes it easy to get a faster, more private, Internet experience” added Mohd Irtefa. 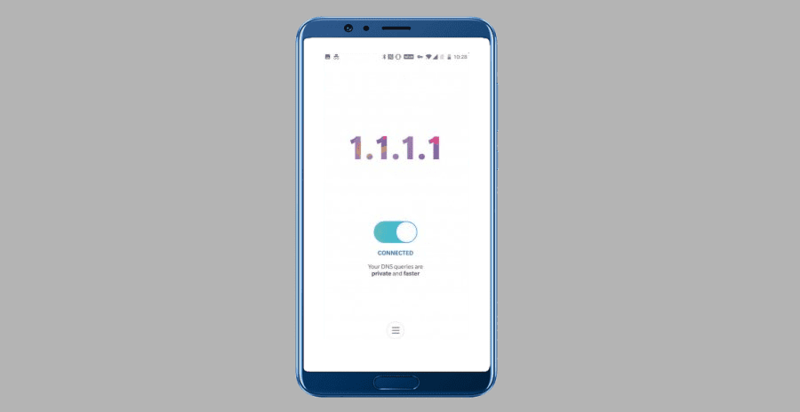 The mobile app uses a support feature like VPN (virtual private network), which directs your mobile traffic towards the 1.1.1.1 DNS servers. Cloudflare’s DNS server funnels DNS traffic that not only makes it difficult for your ISP to track the sites you are visiting, but it also allows you to freely browse the site you want without having your connection censored or hijacked. Cloudflare is committed to not tracking users or selling advertising. However, it needs to keep logs of user data for 24 hours to prevent abuse and debugging issues, after which all the logs will be purged. The company has also retained KPMG, the well-respected auditing firm, to audit their code and practices annually and publish a public report to confirm that it’s not selling user information. The Cloudflare app is user-friendly and mobile users can easily push the on/off button to operate the DNS service. You can download the free app from Apple’s App Store and Google Play to make your internet connection faster and safer.